PLAINVIEW, NY, APRIL 9, 2018 – Core SWX, a leader in battery and charging solutions, introduces the Voltbridge Fleet Battery Management Platform along with Bluetooth Low Energy enabled versions of its Quad Fleet and Quad Fleet Micro Chargers, Fleet Qi and Fleet QMi, at NAB 2018 (Booth C5633). 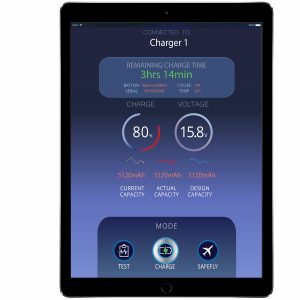 This innovative platform allows a single user to oversee dozens of professional camera battery chargers and hundreds of battery packs, all controlled and monitored by a mobile device via its dedicated app. Core SWX also announces the Fleet Qi and Fleet QMi quad chargers with built in Bluetooth capability to complement the Voltbridge system for a complete battery management solution. Building upon Core SWX’s patented wireless battery communication platform, Voltbridge streamlines the process of determining what V-mount and Gold mount battery packs are viable, and which should be inspected more closely by simultaneously monitoring multiple chargers and those batteries connected to it. It also offers the ability to sort, highlight and select hundreds of connected battery packs’ based on a variety of smart data so users can quickly identify packs with diminished service life or cell imbalance, providing an opportunity to test and evaluate the packs through the system. Once the test and calibration is completed, the user can view or email the results of the pack, to maintain a service log. Prior to this innovation, service technicians were required to review each charger’s display manually, and the most sophisticated charging systems’ LCD would only display the data for up to four battery packs at a time. Lithium-Ion battery packs are the most prevalently used batteries in the production industry today, however there are well documented, inherent risks with the chemistry. The quicker you learn of a potential issue, the better the chance battery capacity can be restored through Core SWX’s proprietary cell balancing algorithm. This helps maximize the ROI and service life of the pack, as well as preventing a potential future battery related concern. The Voltbridge Fleet battery management system also allows users to remotely initiate Core SWX’s SafeFly mode to discharge packs to under 30 percent charge capacity, which is the current Lithium-Ion threshold for safe transport according to the FAA and IATA. The Fleet Qi and Fleet QMi quad battery chargers support numerous battery packs, including those from Core SWX, RED and Anton/Bauer, providing peace-of-mind to multiple crews on location with legacy packs or rental batteries. The new chargers have four independent charge bays, allowing each bay to focus on the individual battery connected, completing a recharge on four 98wh battery packs in 2.5 hours. Core SWX is the market leader in batteries and charging solutions for the digital cinema and the professional video industries, along with emerging markets such as drones and virtual reality. Our flagship products, including the Hypercore line of batteries, remain at the forefront, providing the power to create in a variety of applications. Compatible with leading professional and consumer manufacturers, such as Sony, Panasonic, Canon, RED(r), Blackmagic Design and more, Core SWX stays ahead of the curve in a technology-driven era that is constantly evolving. For more information, visit www.CoreSWX.com.